If Le Relais’s slopes could talk…. Winter—this season of whiteness and cold—virtually created the municipality of Lac-Beauport. Until the founding of Le Relais in 1936, no one had thought of suggesting that tourists from Montréal, Toronto and the US come visit this small town where the lake meets the mountains. Tourism was a summer activity mainly found on both sides of the St. Lawrence, from Cap-Diamant to Tadoussac, and from Lévis to Cacouna. But in the mid-1930s, a postcard invited people to tame winter and practice winter sports. In the photograph: a checkpoint, and a line of skiers waiting to grab a cable that would pull them to the top of the mountain. Le Relais was born, and winter was conquered. The idea of building a ski resort in the Québec region emerged during the grey depths of the Great Depression, winter 1933–1934. Although Québec’s junior chamber of commerce pictured it on the Plains of Abraham, Herman Smith-Johannsen, a Norwegian better known as “Jackrabbit,” convinced developers that the resort would be a better fit further north, on Mount Murphy. The mountain was purchased for $1,000 in 1936. James McManemy, a broker and president of the Quebec Winter Sports Association, invested $1,500 in the construction of Le Relais ski center. A large-scale public offering raised $8,500 to build a small lodge at the foot of Mount Murphy and a ski jump on Mount Taylor (also known as Mont-Tourbillon). The Charlesbourg bus company took care of transportation from Québec. Competitions gained traction, and Le Relais grew more and more popular. It’s also where the first great Quebec skiers were trained: Gaby Pleau, Laurent Bernier, Conrad Delisle, Tommas Dennie, Tom Monaghan, André Bertrand and many more. Over the years that followed, Le Relais maintained its reputation as a major ski resort. It played host to the world’s best skiers while headed successively by such tenacious individuals as Joseph Aubé, Laurier Drouin, Clément Leclerc, Jean Papillon and Paul-E. Delisle, in collaboration with the Société pour l’avancement du ski. 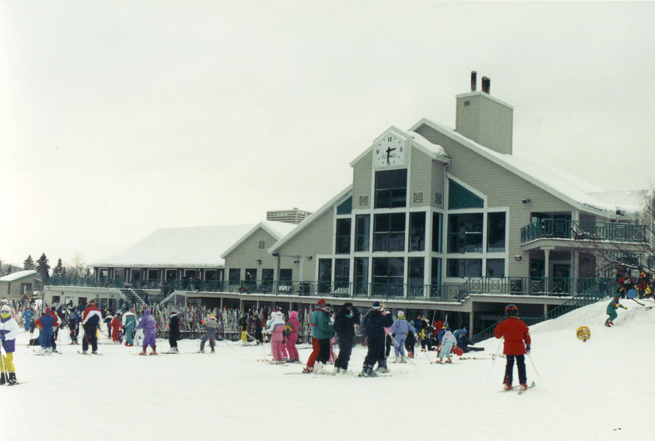 The first ski lodge, which was inaugurated in January 1938, was named “Le Relais.” It served as both a restaurant and the family residence of Laurier Drouin. Ski lessons have always been and still remain a central concern of the owners of Le Relais ski center. The Redskins club, an organization dedicated to promoting sports, set up shop there in 1946, adding the development of skiing to a large list of recreational activities. 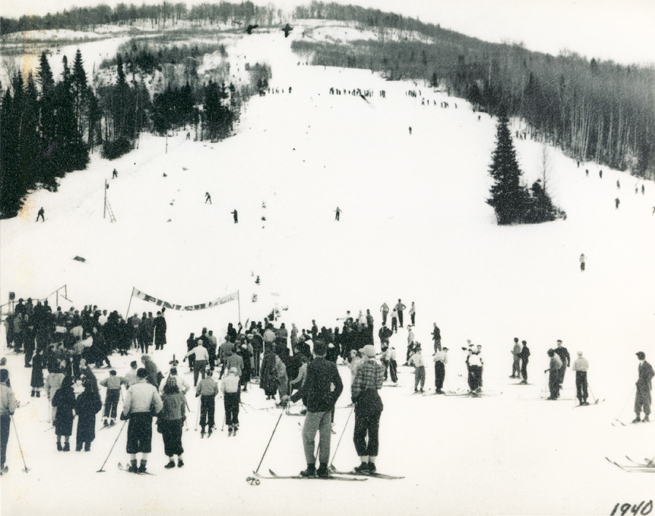 It was also on these slopes that Gaby Pleau created the first women’s-only ski school and that Suzanne Proteau-Blais and Jean-Claude　Lafrenière, taking over the Redskins skiing club, founded the first ski school affiliated with the Canadian Ski Instructors’ Alliance. Diane Lethiecq continued this work throughout the structuring period, assisted by Yvon Bouchard. 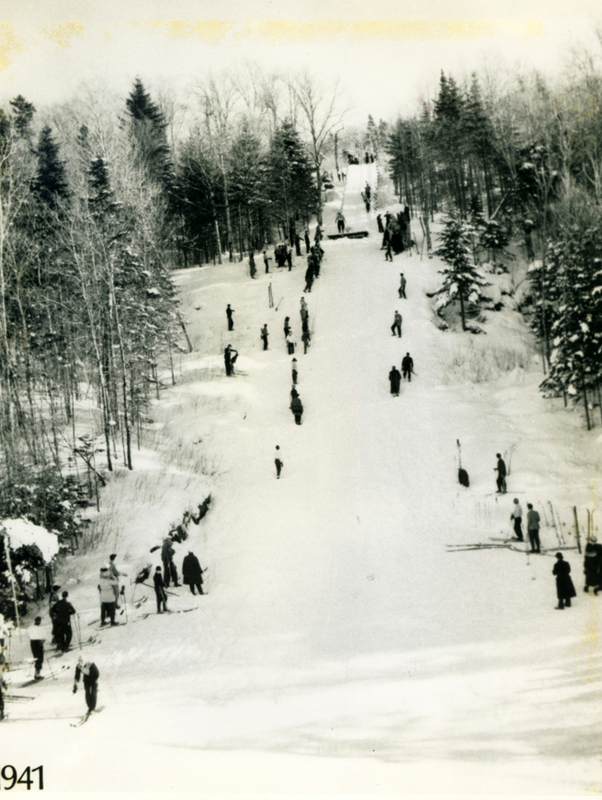 In 1938, Laurentide Ski-Tows Limited was put in charge of operating the lifts. Under the leadership of Jacques Légaré, Le Relais acquired a double chairlift in 1962. At that time, many renowned skiers, including Pierre Jalbert, Ginette Séguin, Monique Langlais and Claire Monahan-Labossière, enjoyed the slopes at Le Relais ski center. 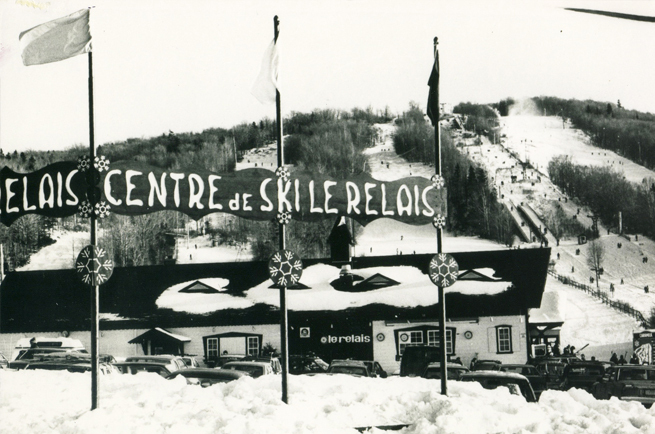 The structuring went into high gear in 1978 when Jean-Claude Tremblay and Suzanne Proteau-Blais purchased Le Relais ski center. Jean-Claude Tremblay was a brilliant administrator and was one of the founders of the skiing industry in Quebec. As a cofounder of the Quebec Ski Area Association, he was a valued advisor to the Tourist Bureau and for the Communauté urbaine de Québec’s conferences. The skiing industry experienced a real boom under his leadership. At that time, the skiable area encompassed around ten runs. These would eventually be lit, to the delight of night-skiing fans. 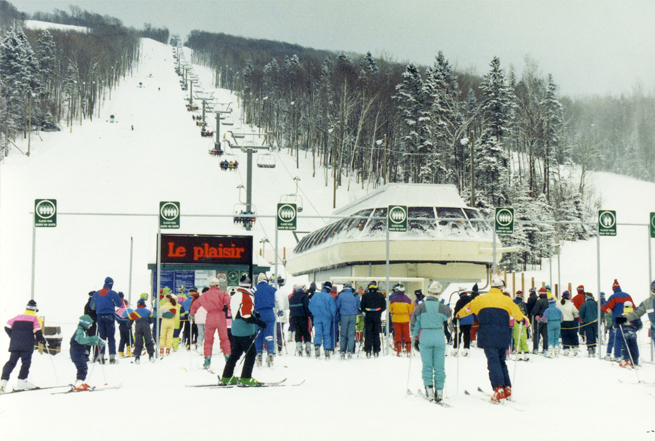 The third phase of Le Relais ski center development started when the CEO of Entreprises P.E.B., Laurier Beaulieu, became the owner of the resort on June 30, 1987. He was a shrewd businessman and surrounded himself with the right people throughout the various stages of the ski centre’s transformation. He was a visionary, and his acquisition of neighbouring lots allowed him to double the number of runs. In fact, several runs at the new Le Relais bear the names of some of its builders. Under his leadership, the ski lodge tripled in size, becoming a modern and welcoming building. For 30 years, Mr. Beaulieu has never skimped on investments and equipment maintenance: the lifts, the cutting-edge equipment for producing artificial snow, the lighting system for night skiing and the slope grooming machinery are a testament to this. For him, customers and employees satisfaction has always come first. Over the years, Le Relais has continued to live up to its reputation as one of the top family ski centres. Then, Laurier Beaulieu passed his entrepreneurial passion on to a third generation. His son, David Beaulieu, now manages Entreprises P.E.B., and his daughter, Sophie Beaulieu, ensures his vision lives on by putting service quality and employee care first.